Stories of migration hit our newspapers and screens every day. While the suffering of people fleeing their homeland leaves no one untouched, their individual stories tend to get lost in the mass of information and the headlines focusing on global politics. The migrants’ voice is an anonymous one, that resonates only faintly in our everyday lives. And thus migrants remain a “them”, heavily discussed but not really understood by “us”. Yet in one way or another each and every one of us stems from a melting pot of genes, ideas and experiences. We all are the product of multiple cultures. For many centuries, establishing a new home on foreign ground has been the fate (or the opportunity!) of millions. 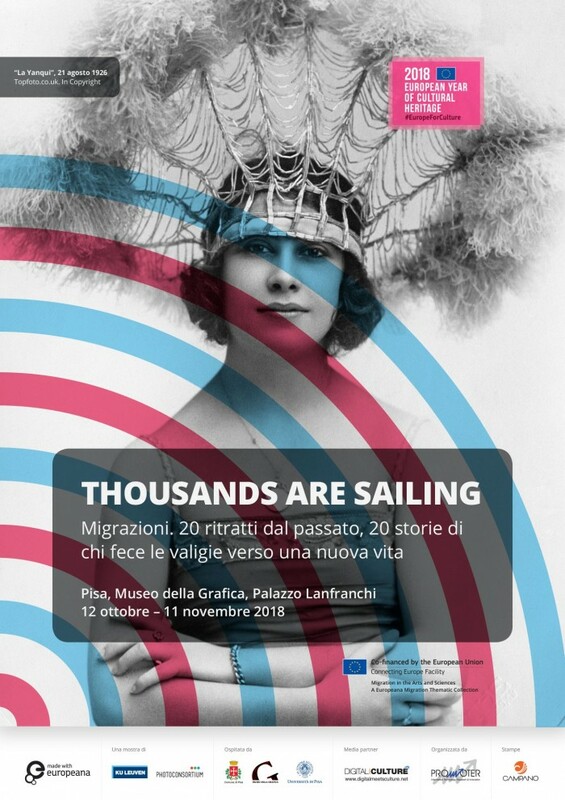 What they left and gained, what they learned and taught, what they shared, created and inspired is at the core of the Europeana Migration Collection and of this PHOTOCONSORTIUM-exhibition. 20 portraits – some formal and posed, some casually or inconspicuously snapped – represent equally as many stories of people who left their native country to go settle abroad. That the portrait genre was chosen as a medium for this exhibition is no coincidence: these images give “the migrant” a face and a distinctive voice, reminding us of the fact that migration isn’t an abstract concept but a daily reality. Contrary to the current debate, this exhibition intently focuses on the positive, the constructive, and the inspirational aspects of migration. Because what would the world be like without the multicultural mix that flavors our lives? It would be “goodbye” to Turkish slippers, the paisley motive and Scandinavian-style knitwear. “So long” to pizza, bami goreng and kebab. “Adieu” to the tango, the samba and the waltz. And “Addio!” to thousands of songs, movies, novels and artworks inspired by migration stories. You’re almost ready to go and discover our portrait selection. Take your time for a thorough look: each photograph speaks not only through captions and descriptions, but also through its visual language. What do these images tell us about the persons depicted? Do they seem prosperous and relaxed, or tired and worried? Do they exude hope and trust in the future, or look uncertain and dreading what lies ahead? As these wordless witnesses start to speak, watching these images turns into hearing lost voices and reliving a past that is worth to be shared. 20 pictures, a treasure trove of stories. These lives-in-pictures represent just a fraction of the history of migration. But even in such a small dose, they get you thinking…. What would make me move away and start over? Would I be leaving a life of bliss, or be setting out for paradise? Maybe paradise means: escaping a terrifying destiny. Or taking matters into your own hands. Or simply: being with the ones you love, wherever that might be.